WHEN a voice from your radio says: “This is an electrical transcription,” don’t turn to another station, for what you are about to hear is one of the wonders of modern broadcasting. Last year the customers of one of the leading makers of electrical transcriptions for broadcasting purposes paid $30,000,000 for the records and station time. It is a big business, this offspring of radio. Every broadcasting station in the United States, without exception, uses these “platters.” Many of the smaller stations depend on them for a majority of the time they are on the air each day. As an illustration of platter adaptability, hour-long programs, such as the Ford hour, have been put on records from the actual chain broadcast, then duplicate platters have been shipped to small stations throughout the country for playing at such later time as local Ford dealers might wish. Along about dinner time in the evening you hear your radio say: “Well, here it is 5:45 again, and Orphan Annie time.” No matter whether in Maine or California, the Orphan Annie doings greet their listeners at that time. But those words were spoken, as well as the rest of the program, four or five weeks before you hear them, put on platters and shipped to the stations well in advance of schedule. Each of the country’s four time belts gets its Orphan Annie, then, at 5:45. The only other way, and not a whit more satisfactory, would be for the Orphan Annie actors to repeat each broadcast four times a night. There is advertising psychology behind all this. Stations and certain types of products have their peak hours of listeners. The youngsters are at home by 5:45, and the sponsors of Orphan Annie know it. The same reasoning applies to other products sold via the air waves. Eight o’clock at night in New York may be a splendid time to sell something via radio, but that is five in the afternoon in California. And eight o’clock in California may be four o’clock during New York’s daylight saving summer months. The platters supply the answer. 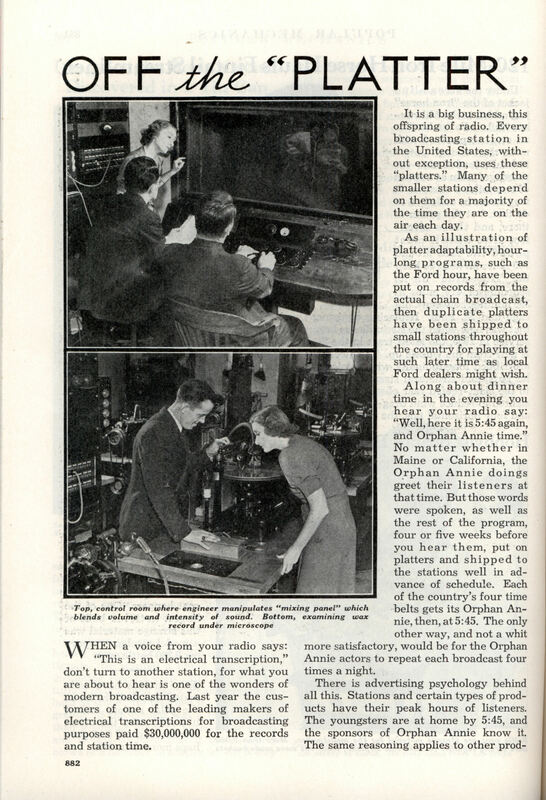 A regular broadcasting studio is interesting, but the plant of a modern electrical transcription company is even more so, for, in addition to the fittings of a broadcasting studio, there is an elaborate and intricate mechanical equipment devoted to the making of the original records, and of the platters after the original has been cut. Transcription studio atmosphere is pretty much the same as in a broadcasting studio. The only essential difference is that the product of the former goes on a record, while that of the latter goes directly onto the air. The only things missing from a transcription studio are seats for an audience. In this respect the business is somewhat similar to the motion-picture studios; the product of both is intended for later consumption. However, at the transcription plants, as at broadcasting studios, you will find musicians rehearsing in various studios, and even overflowing into the halls. Actors sit waiting and watching the clock, for this business maintains a strict schedule. A platter runs fifteen minutes on the air, but there is an average of eighteen hours of writing, rehearsing, casting and producing for each quarter hour of entertainment. Imagine a program being recorded. In a studio the action is taking placeâ€”the music, sketch, talk or whatever is to be put on wax. As it proceeds, an engineer, seated at a “mixing panel,” and watching through a glass window the activity in the studio as he listens, manipulates the knobs on his panel, so proper volume and intensity of sound are obtained. In an adjoining roomâ€”the recording roomâ€”a stylus is cutting its continuous circular path around a blank record, the music having been passed on to that room via wire from the control room. The program finished, the record goes into a vacuum-sealed chamber. Here, for twenty minutes, it is bombarded with tiny gold particles, so that it comes out with a millionth-of-an-inch gold plating on every little groove and hollow. Next the record, with its beautiful gold film, goes into a solution of copper sulphate. When it comes out it has a layer of copper on top of the gold. Another machine adds a thick layer of copper to the surface. Now, obviously, we have a negative impression of the original record, impressed on the gold, to which the copper plate is attached. The wax is then stripped off, being no longer needed, and the cop-per-and-gold disk is trimmed down to size. Next it goes into a chromium bath. Out of this it comes chromium-plated, goes into a drying oven, gets a final smoothing and aliningâ€”and we have a master record from which any number of platters may be made. Why the gold film? Because gold insures purity of the original sound, and freedom from any possibility of scratchiness. Experience and experiment have proved it the best material for the purpose, and superior to graphite, which once was the accepted finish. Vertical, or “hill-and-dale,” recording is conceded superior to lateral recording, and by far the greater portion of transcriptions is made by the former method. One excellence of this system lies in the fact that a vertically cut groove permits a lightweight reproducer to be used, with a very small moving part that easily and accurately follows the extremely complex waves impressed on the record. This results in low-record wear, which in turn keeps mechanical noises to a minimum. Phonograph records are made by the lateral recording method, the sound waves being cut on the sides of the groove. When played, the needle bounces from side to side of the groove. As a result, after about twenty playings the sound waves begin to wear from the impact of the needle, and the record loses its original sharpness and purity of tone. However, with a vertically cut transcription, the sound waves lie at the bottom of the groove, and such a record can be played from 1,800 to 2,000 times before it shows any diminution in tonal quality. The electrical transcription makers have had to lick many problems in order to turn out their present product which often defies detection from an original broadcast. The tonal range of the human ear had to be considered, and every step taken to fulfill its exactions. The normal ear has a range from twenty to 16,000 cycles per second. 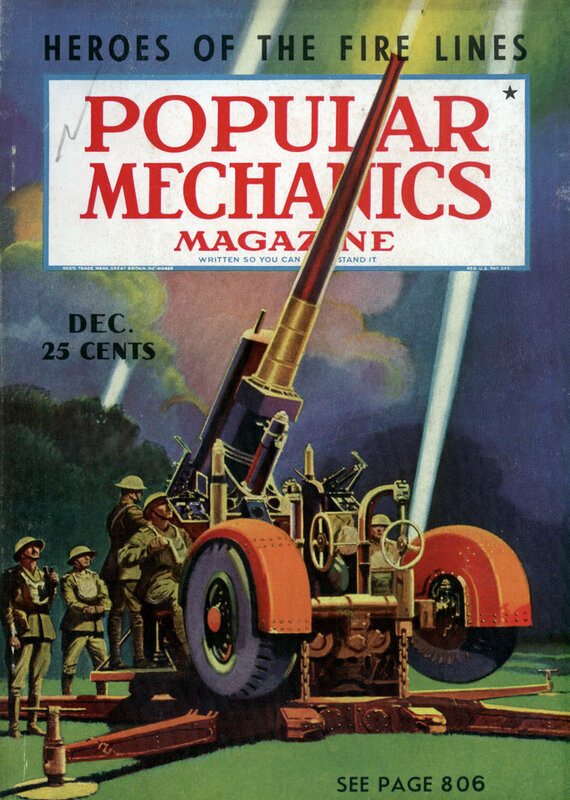 At the lower end are the slow vibrations, such as cannon fire. At the upper end the jingle of keys or the higher notes of an oboe will reach 16,000 cycles. Your telephone will transmit within the forty to 3,500-cycle range. Lateral-cut transcriptions reproduce within the forty to 6,500-cycle range. Vertically recorded transcriptions extend the limit to 8,500 cycles, and are equal in trueness to network programs put on the air at the point of origination. The commercial radio set of today reproduces vibrations up to approximately 8,000 cycles per second without loss of true tone. The transcription makers, whose records capture and reproduce up to 8,500 cycles, are keeping up with the reproducing instrument in your home. As sets are improved, transcriptions will likewise keep step. Experimental work has already proved that it can be done. As a component part of the radio industry, the transcription makers have proved that they are abreast of the procession. It all adds up to the fact that the listener who hears such a record on his radio is ready to credit it with being fully the equal of a “flesh” broadcast from a conventional studio. I absolutely love the term “electrical transcription.” It gives me the image of Rosie the Robot as a court reporter. What’s funny is that tape recorders were already avaliable back then. The only problem was that the electronics weren’t as advanced back then, but this was fixed in 1941 and you could modify those tape recorders to give you high-fidelity sound. What they probably didn’t realize at the time was that this process would allow people in the future (ie now) to still be able to listen to thousands of hours of classic programming. We can still listen to Burns and Allen, Jack Benny, Amos ‘n Andy, Dragnet, Fibber McGee and Molly, etc. I had heard it was the high fidelity of German designed magnetic recorders that allowed Hitler to make “live” speeches from several cities at once. After the war… amazingly…. American tape recorders sounded much better. PS: Thundercat… I predict the future will enjoy our VHS and DVDs. I have about a hundred VHS cassettes from the 1980s… I saved the commercials in the shows I recorded, thinking that they would be the interesting bits in the future. Is that a switchblade in a screwdriver? Well a jack knife anyway. I *think* switchblades are spring operated.